Farmhouse Culture Gut Shots (or simply “Gut Shots” for short) are a line of probiotic-rich beverages that don’t just taste good but are also good for your digestive health. Here’s our Gut Shots review. What Is Farmhouse Culture Gut Shots? 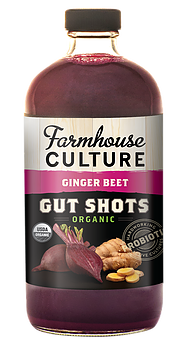 Farmhouse Culture Gut Shots are a line of probiotic-rich beverages that come in 16.5-ounce bottles available in five different flavors: Classic Caraway, Garlic Dill Pickle, Ginger Beet, Kimchi, and Smoked Jalapeno. There are 11 1.5-ounce servings in each bottle and are between 5 and 10 calories per serving. All five flavors are USDA Organic Certified, Non-GMO Certified, feature plant-based vegan ingredients, and are both gluten free and dairy free. Farmhouse Culture Gut Shots Features: How Does It Work? Farmhouse Culture Gut Shots are probiotic beverages, which contain high levels of healthy bacteria that have been clinically proven to have health benefits for anyone who suffers from gastrointestinal disorders like Crohn’s disease, Irritable Bowel Syndrome(IBS), and Inflammatory Bowel Disease (IBD). These bacteria proliferate in your gut after drinking these beverages (hence the name “Gut Shots”), aiding in digestion by helping to provide relief from the symptoms of IBD, IBS, and Crohn’s. Who Makes Farmhouse Culture Gut Shots? Gut Shots are made by Farmhouse Culture, a probiotics food and beverage company founded in 2008 by Kathryn Lucas, a chef that specialized in fermented foods like kimchis and krauts. Lucas discovered that during the fermentation process, many of the foods and beverages she created were rich in probiotics, leading her to create a full line of probioticcrisps, beverages, kraut, and vegetables. Farmhouse Culture strives to provide non-GMO, organic, and gluten and dairy free productsacross all of its food and beverage lines. In many cases, these products have also been produced with sustainable and fair trade methods as well wherever possible. All Gut Shots begin with organically grown green or Napa cabbage and water. Different varieties are seasoned and flavored with a variety of organic ingredients, including sea salt and caraway (Classic Caraway), cucumber, sea salt, dill, and garlic (Garlic Dill Pickle), red beets, ginger, and sea salt (Ginger Beet), daikon radish, carrot, leek, sea salt, ginger, garlic, paprika, date sugar, wakame, cayenne, and bird’s eye chili (Kimchi), and onion, roasted smoked jalapeno puree, daikon radish, carrot, and sea salt (Smoked Jalapeno). Each bottle also contains 110 million colony-forming units (CFUs) of lactic acid bacteria per bottle. These probiotics include L. Pentosus/Plantarum, L. Paraplantarum, L. Koreensis, L. Brevis, and L. Hammessi. Gut Shots, and other Farmhouse Culture products, are routinely sold throughout the United States and Canada at hundreds of specialty health food stores. This means pricing will vary – at Whole Foods for instance (a chain that is notorious about over-pricing certain things) Gut Shots retail for around $5.99. Farmhouse Culture Gut Shots Reviews: What Do Customers Have to Say? You would think that beverages that are essentially sauerkraut juice wouldn’t be especially appetizing, but there is a very strong following out there of customers who have enjoyed Gut Shots for quite some time. While the products aren’t available on Amazon and hence have no reviews there, independent reviewers have been saying very positive things about this product line. Great for Intestinal Health – The probiotics in this product are excellent to maintain and replenish intestinal health in any number of situations ranging from recovering after being prescribed some very strong antibiotics to trying to stave off the effects of IBS and IBD. Health-Conscious Product – As this product line is non-GMO, organic, plant-based vegan, and gluten and dairy free, it’s an excellent choice for anyone who is health-conscious and wants to make sure none of those substances are in their diet. Not Going to Be for Everybody – The distinctive taste of Gut Shots aren’t going to be for everyone. No matter how much you dress up these flavors, if you don’t like sauerkraut you’re going to have a hard time enjoying even the mildest-flavored of these beverages. Expensive – Nearly $6 for a 16-ounce bottle at Whole Foods is likely the high end of the pricing spectrum for Gut Shots, but this product line is still going to be on the expensive side. However, it’s designed to be sued sparingly – there are 11 servings per bottle after all – so one bottle may last longer than you think.